Honor Your Own Wonderful Women! The idea for Malta House of Care began in 2004, when a group of Hartford-area Knights and Dames of Malta agreed that the mission of their international organization–to serve the sick and poor–called them to do more than just talk; they felt they needed to take action to address the striking disparities in health care access and quality in the Greater Hartford region. 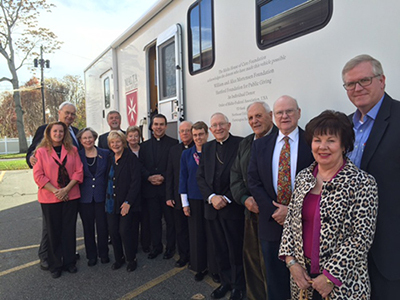 Together with Saint Francis Hospital, other committed community leaders, and with crucial financial support from then-Archbishop Henry Mansell and the Archdiocese of Hartford, the group determined that a mobile clinic was the correct model for Hartford; this way, critically needed primary health care would be delivered right into the neighborhoods where it was needed most, on a van that would be parked at trusted, safe sites close to the patients’ homes and jobs. On July 9, 2006, Malta House of Care welcomed its first patients to St. Peter’s Church at 160 Main Street in Hartford. By year-end, Malta had provided 477 free patient visits to people who would have otherwise gone without needed medical attention–or would have ultimately ended up in a local hospital emergency room. Today, the big, white, iconic Malta van and its passionate corps of medical volunteers visits several neighborhoods–Asylum Hill, the South End of Hartford, plus Burnside Avenue in East Hartford–and serves about 2,200 uninsured adults. Malta House of Care, Inc.
Malta House of Care, Inc. and Malta House of Care Foundation are 501(c)(3) nonprofit organizations. ©2019 Malta House of Care, Inc.